Pluto Close Up: Mark Your Calendars! Save the date: July 14th 2015. That’s when the probe launched in January, 9 years ago, will fly by Pluto and its five moons capturing some no doubt profound pictures and data for us to mine for years. This will be the closest and highest resolution look we’ve gotten at Pluto ever, and I certainly feel that it’s going to be quite amazing. In the middle of February of 1930, the dwarf planet was first discovered. And as everyone knows, Pluto was demoted from status as “planet” in 2006, to “dwarf planet”, when the astronomical definition of the word was revisited. However, back when Pluto was the ninth planet from good ‘ol Sol, we launched the New Horizon Space Probe to get a good look. And after nearly a decade of travel, it approaches the target. Launched at a speed of 58,536 km/h (36,373 mph), it grabbed a gravity boost from Jupiter adding 14,000 km/h (9,000 mph), making it the fastest man-made object ever! Since then New Horizon has been in hibernation, waking up every two months or so to calibrate its instruments, and make sure everything is in working order. 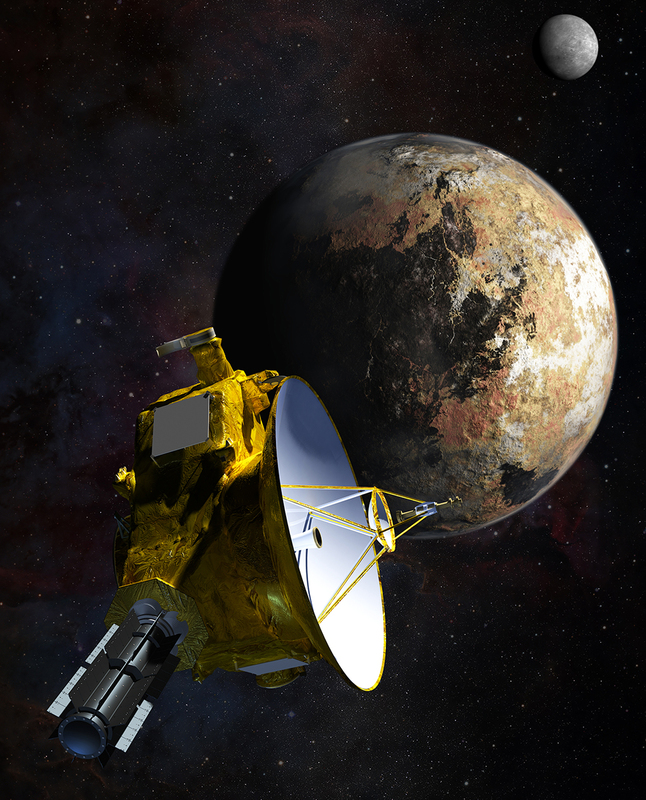 And now it’s official approach to Pluto has begun! Pluto and its moons aren’t the last mission for this extraordinary probe. NASA has plans for the probe to travel onward past Pluto into the outer solar system, joining its cousins Voyagers I & II in the Oort Cloud and beyond! The official end of its mission is scheduled for 2026, but with any luck we’ll be in for a surprise of a longer life and more amazing photos. Dweebed will keep you up to date on this probes life & times as it continues its epic journey. Stay tuned!